Apart from buying gifts for cats, some things can serve as something highly useful that you sometimes start to consider them as necessities. Cat products like the best cat litter box, cages, scratchers and more, are some of the things that provide comfort that you just can't have without it. What makes it more interesting, is that there are some product that serve 2 different purposes making it a practical investment that could save you time, money and effort apart from providing you with comfort such as the best cat tower. It serves as a tall cat lounge that can be used by several cats and is also designed as cat scratchers. This list of Cat Towers are more like the best cat scratchers combined that could be used by multiple cats all at once. If not used for scratching, cats enjoy a great time lounging, sleeping or playing around with it. It is great for pet owners housing lots of cats. Rather than buying several pieces of cat lounge and cat scratchers, why not just one or two cat tower. This also works great if you plan on saving space around the house or you live in a tiny or medium size apartment. 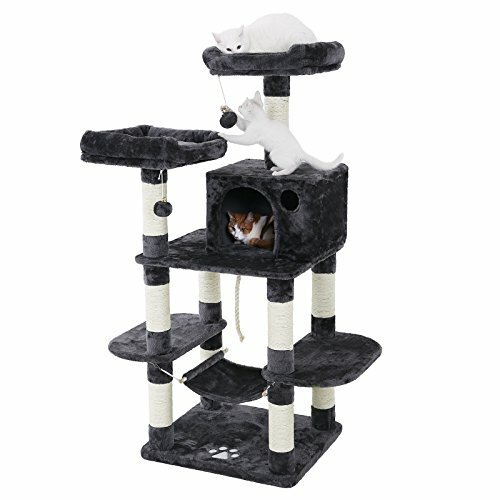 Cat towers work or play area extends upward instead of sideways which saves you a lot of space and could really bring some enjoyment as cats loved to climb up tall areas. This product is perfect and one of the best cat gifts. The other name it is known to be is cat condo. Basically, cat condo, cat tree and cat tower is just the same. It is referred to as cat condo as it lounges your cat and/or cat tower as it can be used by your pet for climbing like a tower. However, regardless of what it's called, there are some types of cat tower or cat condo that does not have scratchers. Some are just made for lounging and climbing. If you already have a cat scratcher at home and would just want to have a cat tower or condo, you can simply have it. But for those who want to have a multi-purpose tower, we have provided a short list of the best cat tower and/or cat condo with comparison and reviews. Is there a cat tower for a single cat? Are there any small size cat tower? Do cat towers need scratch post? What cat tower size do I need? Can several cats use cat tower all at the same time? This is the SONGMICS kitty cat tower furniture. It's tall enough for a cat to enjoy climbing. The tower is covered by plush surface that serves as a platform for lounging cats. Great thing about this cat tower is the elegant design and aesthetics. The simple black and white color goes perfectly unto any home furniture or interior home designs. It does not consume a lot of floor area which makes it a space saving cat furniture that could provide long hours of fun and timeless scratching. The tower is high, about 56 inches in height. It has a floor space of about 38 inches in length and 24 inches in width. There are hanging balls and ropes that cats could play with.The tower uses platform board that is CARB certified. It's very strong, sturdy and safe. All platforms are covered with soft plush to make lounging comfortable for your cats. It has considerable measurement that saves space. The tower has a built-in cat toy of ropes and balls. It serves as a scratcher to relieve scratching behavior and lounger for cats who want to rest or play around. This tower can be used by several cats. The tower can withstand a playful behavior of cats. Our second choice is the Cat Tree from Go Pet Club. It's basically the same concept that of a cat condo or a cat tower. It just happens to be that the manufacturer, Go Pet Club, wants a more unique name than the usual. 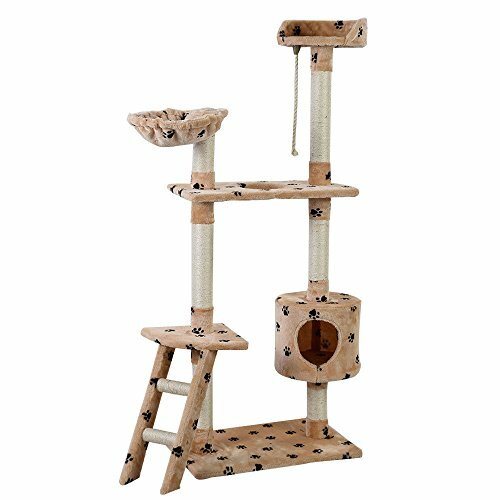 This cat tree or tower features a very tall lounging area, about 72 inches high. It looks very classy and elegant. The professional design includes poles covered with a rope that acts as a scratcher. It's a way of putting 2 types of cat equipment in one. It'll save you time, money, effort and space with only single cat furniture. It could cater the scratching and lounging needs of several cats, all at once. Cats can choose between lounging in platforms or in box houses. Apart from scratching and lounging, cats can play around with the mouse toy included in the set, attached to a rope. The poles are covered with sisal ropes which can withstand heavy and intense scratching. The mouse toy can only be used by at least 2 cats. It could lead to a cat fight if you have more than 2 cats at home. It's also attached to a thin string of sisal ropes which cats could pull off. This cat tree might save you some floor space but it's so tall, about 6 feet high which can really take some view inside your home. The Tangkula Cat Tree tower is one of the best cat tower and the fanciest. It has a fancy design if cat paws all over the fabric cover. The cat tower is in considerable size, not so short and no so tall. It also covers a small floor area, making it space saving cat furniture for small rooms and houses. The tower is a playhouse, lounge house and scratch post for cats. That's three cat equipment all packed into one at a great and affordable price. Saves time, space, money and more importantly, provides comfort and fun. It is very strong and stable. This tower can withstand rough behaviors and playfulness of cats. The cat tree uses E1 particle board. Cats can use this cat tree or tower in several ways, a scratch post, play house or a lounging area. The playful design could work with different home interior designs. The cat tower does not include any play toys such as mouse toy or a cat ball. It looks fairly thin for a play house that is about 5 feet tall. 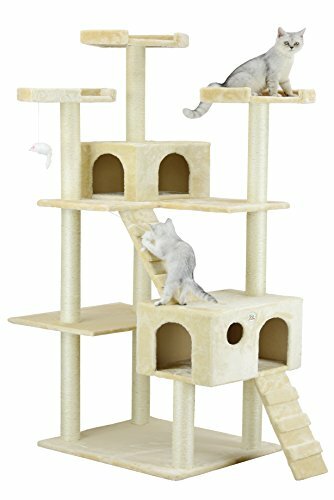 The Cat Tree Tower from AmazonBasics is one of the few affordable best cat towers with good rates and reviews. It has a fair and simple design that features three different tier levels where the upper level being a comfortable cat lounge. It has poles covers with jute which make it great for relieving cats with scratching habits. It can work great as a scratcher for several cats and a play tower. However, there's only one comfortable lounge area on top and the other levels are plain platforms. The 2 size can really help you deciding what fits perfectly in your home space. It is very easy to assemble. It only uses simple screws to connect each part of the tower. There are a total of 7 poles, each acts as a scratch post. It has a square base, ideal for fitting in tight space and small area rooms or houses. The medium tower has only 2 levels and large has three. The levels vary with its size. There is only 1 round shape lounge area. Medium size will only work best for one or two cats. Our last product to be included in our best cat tower reviews is the Cat Tower Scratcher from BestPet. It actually has a great design being a play tower but the colors make it seem so strong to fit any home interior design. However, it may have strong colors but apart from aesthetics, this tower is one of the best. It features a multi-level play and lounge house for cats where each level has different purpose. It's fairly large and tall which makes it great for multiple cats. Each levels offers different purpose. First level is a cat house, 2nd level is a cat house with cat toy and scratch post. The tower is strong and durable. It can withstand cat behaviors and playfulness. The scratch post does not go all the way the pole. On the third level pole, the sisal ropes only covers half the pole of each part. The only colors available are dark and strong colors which makes it hard to much with home interior designs. It has fabric covers prone to scratching due to lack of scratch post on the first and 2nd level. It's always best to look for product or buyer's guide before you make any decisions in investing into something. The guide will help you point out and determine some of the key features of the product that needs some consideration to check whether it passes the standards of a good quality product. In this case, a cat tower have some key features that needs not to be taken lightly as some of this cat furniture does not come cheap and you wouldn't want to spend on something and be done with it after just a few weeks of use. The best cat towers usually serve different purpose. It's not just something where cats could climb. Most of the best cat tower also acts as a play, activity and lounge area where your cats could play around, do their cat activities and rest. Adding to that, there are cat towers that feature a cat toy and a scratch post. It's a simple cat furniture all packed into one. This saves you a lot of time, money, effort and home space using only single cat furniture. Usual materials for a good cat tower includes an E1 grade particle board and compress wood. A cat tower with a scratch post would have sisal ropes. Some uses jute instead of sisal. All these main materials will generally constitute a strong and durable cat tower that could withstand adorable and harsh behaviors of your cat. Scratching is one of the most destructive habits of cats and the best cat tower must conform to the standards of sustaining itself against cat scratch. Product dimension is very important when it comes to furniture. You must determine the size and dimension of cat furniture before you try to purchase one. 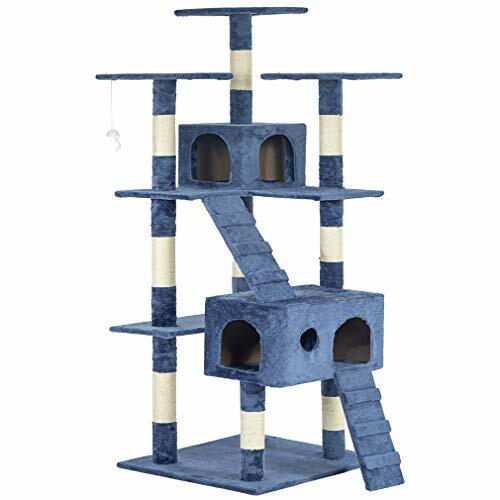 Cat towers fairly use a decent amount of floor space with average dimension of at least 22 feet in length, 2 feet in height and 3 to 6 feet high. Check the available floor space in your bedroom, living room or dorm room if it can fit the dimension of the cat tower. You wouldn't want a crowded room with your cat playing around. Some people consider cat furniture as part of their home furniture. An option to choose between sizes and color is really something you want to look forward to. Cat trees, cat towers, play towers or lounge towers usually consume wider dimension and floor area like that of your best cat litter box. But unlike litter boxes, it is something placed in a non-private place where you'd instantly see upon entering the room or house. That's why you would want to choose certain colors and size to fit it with your home's interior design and furniture. You would want it to look aesthetically pleasing to you and your visitors. It would be frustrating if a cat furniture as large as the cat tower could only be used by a single cat. Regardless whether a cat tower is small, medium or large, it should be able to lounge at least a pair of cats. The best cat tower is designed to cater the needs of several cats at home. You'd see several platforms, lounging area and scratch post built in it. Some also have 2 to 3 hanging cat toys or cat balls just to accommodate the many. Fortunately, regardless of the key features we have discussed earlier. There are cat towers available for lounging just one cat. However, most of the best cat towers have different sizes you can choose from. You can look for a small size cat tower for the play and lounging needs of your cat. It is also in your best interest to look for a cat tower with a built-in scratch post. A tower with no scratch post might end up with cat claw damages from excessive scratching, especially the part where fabric is present. Yes there is. Always look for a cat tower with sizes available. Best cat tower usually gives you an option to choose size, design and color. It would be aesthetically pleasing when you have a cat tower that goes along with your home furniture and interior decorations or designs. Additionally, small cat towers can still be used by at least a pair of cat. Most small cat towers have first and second level where one cat could enjoy as with the other. There are some cat towers that do not but it is greatly advised for it to have. Cats have intense scratching behaviors. That is why we often end up with torn couches, pillows, bed, etc., something that most cat lovers could relate to. Cat towers without scratching post would end up with extreme scratching damages from the claws and paws of your cat. A scratch post can divert your cat's behavior from scratching the fabric covered part of the cat tower, prolonging its longevity. Check the area of your room, dorm, living room or any area of the house you want to have your cat tower placed. Vary the space you have with the dimension given in the description of the product. You also might want to consider the height. For small spaces, it is best to keep it to medium size tower. A small room with a large cat tower with multiple cats lounging and playing around would seem to create a stressful environment. Yes. Medium size to large size cat tower can lounge and provide a good time for several cats all at once. Even small size cat towers can lounge at least 2 cats. That's because there are no single level cat towers. A small cat tower would still have first and second tier level where each cat can enjoy each level for themselves. 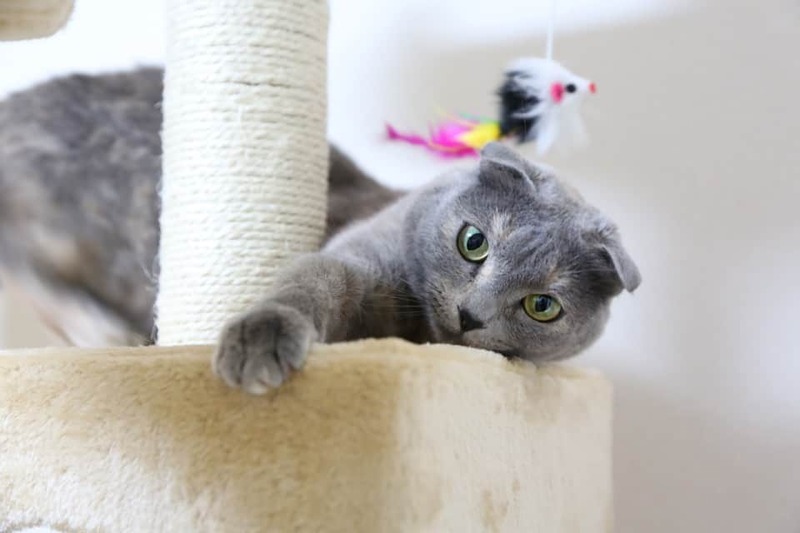 Apart from being multi-purpose cat furniture with scratch post, play area, toys, lounging area and more, cat towers, it can be something that controls the behavior of your cat by relieving them with their excessive animal habits. The general why your cat needs a cat tree or cat tower is to provide them with something that could mimic and tend to their natural needs without going outside. Indoor pet cats are usually deprived from natural recreations such as tree climbing, lounging, playing around and scratching. We would not want to deprive our pets with what aggravates their natural instinct. That is the reason why people that uses the best cat cages still let their cat roam around the house. The only thing that frustrates them is that without anything to alleviate their animal instincts or habits, they always end up with damaged furniture. The best cat towers are usually a good investment for cats. Tower or cat tree along with the best cat litter box, cat scratchers, anxiety collars, cat cages and other accessories our cat needs to make their life comfortable and fun. It is something that we want to show and share affection to the animal.